Flemington, NJ, January 15, 2019 — Gloria B. Gertzman, Ph.D., D.M.D, F.A.G.D., C.C.H.P. 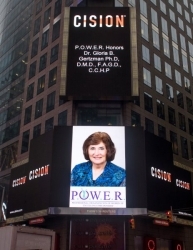 of Flemington, New Jersey has been honored on the famous Reuters Billboard in Times Square in New York City by P.O.W.E.R. (Professional Organization of Women of Excellence Recognized) for her outstanding contributions and achievements in the field of dentistry.